As skin ages, it becomes increasingly irregular. Its uniform tone is replaced by redness, spider veins, brown spots, age spots, and other color irregularities. Its even surface may become raised, pitted or marked by growths or scars. Its texture can change too, with the skin becoming rough, dull, loose, and wrinkled. Each person ages differently. Changes in skin tone, surface regularity, and texture are different for each individual—and Cosmetic Laser Therapy is based upon this fact. Because a single laser cannot treat all signs of aging, Cosmetic Laser Therapy combines a number and variety of lasers. With the widest selection of lasers available in the Chicagoland area, Premier Dermatology provides the best treatment option for each patient. Facial redness may result from ethnic skin type, sun exposure, acne, and the chronic disease known as rosacea. Because this unattractive condition tends to worsen and spread overtime, individuals often seek cosmetic treatment. Pigmented skin lesions are at, dense concentrations of melanin, the substance that gives skin its color. 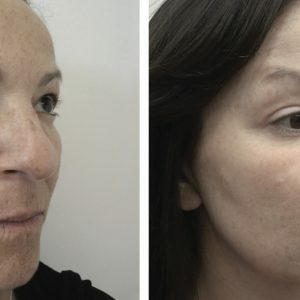 They include birthmarks, moles, freckles, “sun spots,” “age spots,” and “liver spots.” While some pigmented skin lesions may be present at birth, most develop from sun exposure or through the natural aging process. Wrinkles are the result of exposure to ultraviolet radiation, from both natural sunlight and tanning beds. Other contributing causes include smoking, environmental toxins, and the natural aging process. In addition to wrinkles, these factors lead to increased skin surface irregularities and roughness, skin laxity, redness, spider veins, and an overall worsening of skin texture. Scarring is part of the body’s natural healing process. As the body repairs wounds, it creates new tissue that differs in texture and quality from the surrounding skin. Scar tissue can be red, white or shiny, thick or thin, and flat, raised, or depressed. Skin tags are balloon-like flaps of skin that hang from the skin’s surface. They are often found at the base of the neck, the underarms, eyelids, groin folds, and beneath the breasts. Sebaceous gland hyperplasia is a condition in which the natural oil glands of the skin become enlarged, creating yellowish, white, unattractive bumps. Although these enlarged oil glands may be mistaken for whiteheads, they will persist if left untreated. Warts are benign growths caused by the human papillomavirus (HPV) infection. These unsightly growths are contagious and should not go untreated. Seborrheic keratoses are dark, thick, warty skin growths that may enlarge over time. 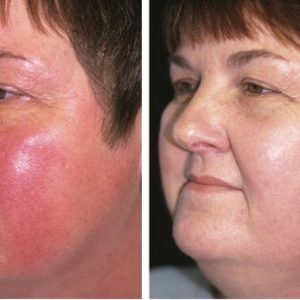 Because each sign of aging requires a different approach, Cosmetic Laser Therapy combines lasers that target different skin conditions. 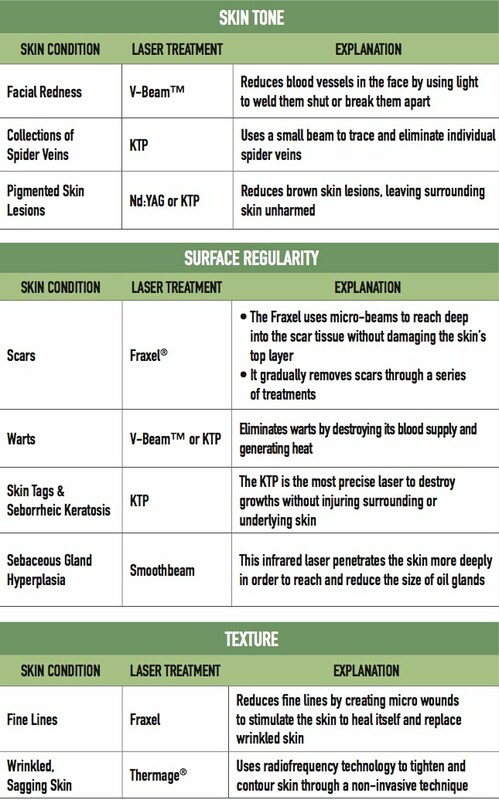 These conditions and their correlating laser treatment are detailed below.